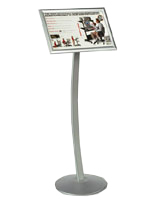 Snap Frames : We include a snap frame and brochure pocket with this sign frame stand! 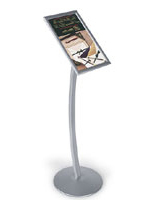 This sign frame has an acrylic brochure pocket attached to the protective lens cover. The brochure pocket allows graphic designers to coordinate and integrate their brochure literature with their printed signage. This sign frame stand has a modern design with its concaved, curved column accentuating any lobby, restaurant, or retail environment. This snap open mechanism allows for easy change of the graphic. 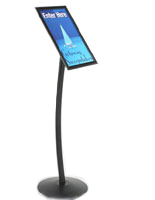 This stand, sign frame is made out of anodized aluminum with a satin finish. 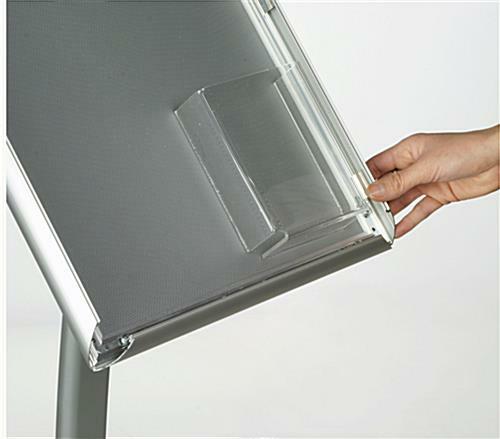 The sign holder frame has a PVC non-glare lens with a 4"w brochure pocket bonded to its lower right side. 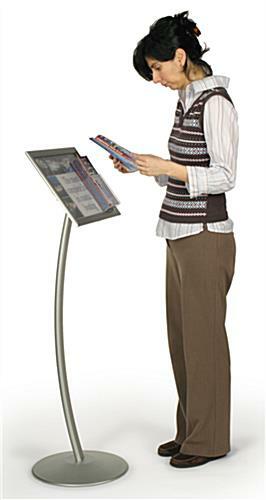 This display stand, sign frame comes unassembled. This frame can be set up in minutes. 4.1" x 5.3" x 1.5"